The Giraffe and the Pelly and me! Aside from nonfiction books on giraffes, giraffes have been used as characters in multiple children’s books. 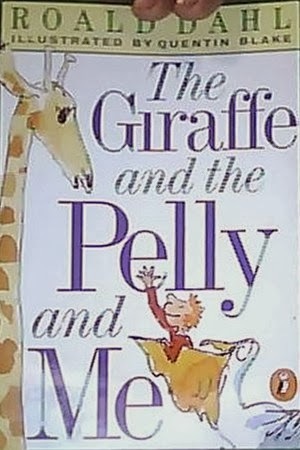 An example of such would be Roal Dahl’s: The Giraffe and the Pelly and Me. 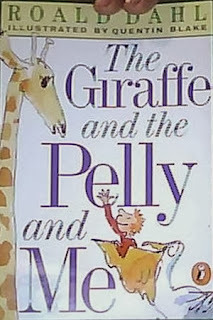 This book is told by the little boy Billy, otherwise known in the book as “I”, a pelican, a giraffe and a monkey (known as “me”). The animals in this book are given human characteristics such as being able to speak and clean windows. In this children’s story, the animals buy property and set up their own business. What better business could these three animals have, but no other than a ladder-less window cleaning service! For a ladder they use the giraffe’s long neck, for a pail they use the pelican large mouth, and that leaves the window wiping to the monkey. The climax of the story occurs when the animals are hired by the Duke. While on the job, they help catch a burglar at the Duke’s mansion. For their wonderful, over the top service, they are granted their dream wishes. For the giraffe it’s the fruit of the Tinkle Tinkle tree, for the Monkey it’s nut trees, for the Pelican it’s a pond filled with Salmon and for the boy it’s candy for his sweetshop. I believe the giraffe was chosen for this literary piece due to its characteristics of its long neck. It makes sense that when one looks at a giraffe, they imagine being able to simply climb its neck to reach high places, as if it were in fact a ladder. Roal Dahl could have chosen another tall animal such as an elephant or even a jumping kangaroo to play this part. I believe he chose a giraffe in particular because of the resemblance of its long neck to that of a ladder that children always seem to want to climb on. 1. Dahl, Roald. "The Giraffe and the Pelly and Me." Wikipedia. Wikimedia Foundation, 29 Sept. 2013. Web. 06 Nov. 2013. <http://en.wikipedia.org/wiki/The_Giraffe_and_the_Pelly_and_Me>.